Whose budget is it, Mr Jaitley? THE MOST definite message that Union Finance Minister Arun Jaitley gave out in budget 2015-16 was that the Centre will share funds for development schemes with states, but the autonomy which states have been demanding for decades will come at a cost. The budget, as well as the decisions taken by the National Democratic Alliance in the run up, show that the Centre is willing to fund states if they are ready to take responsibility for implementing schemes effectively. It is pouring money for states. 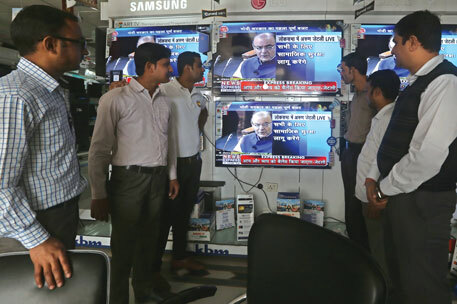 Just days before the budget, the government accepted the 14th Finance Commission recommendation that awarded 42 per cent of the Central tax pool to states, an increase of 10 per cent from the current share. 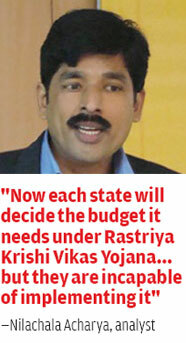 This means states will get Rs 5.24 lakh crore in 2015-16. An additional Rs 3.04 lakh crore will be given to states through grants and plan transfer (see ‘States at centre’). But with money comes responsibilities. The Centre has decided to retain support for programmes that are a national priority, such as poverty alleviation, while giving states the responsibility to implement others with yet-to-be-finalised budget-sharing mechanism. The Central government will stop funding eight programmes, including the Backward Region Grant Funds in operation in 250 districts and the National Mission on Food Processing. It will support 31 Centrally-sponsored schemes while 24 will be implemented with states bearing more costs. Under this new mechanism, programmes such as the National Rural Drinking Water Programme and Swachh Bharat Abhiyan will be funded by the Centre and programmes such as the Mahatma Gandhi National Rural Employment Guarantee Scheme (MGNREGS) will continue to get full Central assistance. But will the states be able to handle this deluge of resources? They may be rejoicing at this windfall, but their worry starts from here. With massive funds, states need to urgently set up the institutional mechanism to manage this responsibility. They have been grappling with unspent budget allocations for various social sector programmes. One of the reasons for this is the absence of capacity at the states’ level to implement programmes. As currently most development programmes are routed through the panchayats, states need to increase institutional capacity of the local bodies in a big way. States and panchayats continue to fight each other over delayed release of funds for programme implementation as well as states refuse to depute functionaries to panchayats to implement programmes. This is the situation after 25 years of enacting the Panchayati Raj system of local governance. On the other hand, for poor states such as Uttar Pradesh, Madhya Pradesh and Odisha, the spread of social programmes will be big and the budget will be high. Currently, these are the states infamous for bad governance and least capacity to implement programmes. So, the states that host the country’s largest chunk of poor may not get any result in the immediate future due to the financial gain and autonomy to implement programmes. 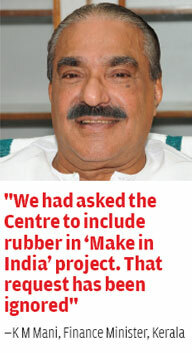 The other important question is how will the Central government monitor the progress of development programmes? The newly formed NITI Aayog is empowered to monitor this, as Modi has written to the chief ministers. The new body comprises chief ministers and we cannot expect objectivity in performance evaluation. What’s more, the new body is yet to spell out the specifics of how it wants to monitor states’ performance with the new changes. From this year, the Central government will send all development assistance straight to the common pool of states to be used as budgetary support. This means state budgets will be the new instruments to gauge development performance. 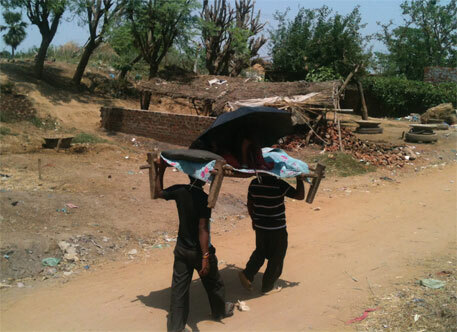 INDIA IS staring at a rural economic crisis, a fact even the latest economic survey accepts. But it looks like the finance minister believes otherwise. The total budgetary allocation for rural development this year—Rs 79,526 crore—is the lowest in the past three years and five per cent lower than last year’s Rs 83,852 crore (see ‘Crucial miss’). The cut comes at a time when most villages are witnessing reverse migration, which has resulted in a three per cent dip in rural wage growth and a huge backlog of unpaid salary under MGNREGS. The budgetary allocation to MGNREGS is Rs 34,700 crore—a marginal Rs 700 crore more than last year’s allocation. The current unpaid wages under the scheme is Rs 4,350 crore. After meeting this liability, the scheme will be left with just Rs 30,000 crore, which is Rs 4,000 crore less than last year’s allocation. Jaitley announced he will “endeavour” to raise another Rs 5,000 crore for the scheme, which will not be part of the budget. The Centre’s flagship rural road construction programme, Pradhan Mantri Gram Sadak Yojana, has also seen a cut in allocations from Rs 14,400 crore to Rs 10,100 crore. The reduction comes despite the fact that the scheme failed to meet last year’s road target because of budgetary shortage. The budget also reduced allocation for the pension scheme, National Social Assistance Programme, to Rs 9,000 crore from last year’s Rs 10,547 crore. As part of its plan to give autonomy to states, the Centre announced states would design and implement the National Rural Livelihood Mission, which supports self-help groups. In the case of agriculture, the finance minister got the diagnosis right when he said in his speech that the country’s farmers are struggling with “declining agriculture income” and “farm distress”. But the pill he prescribed for the malady is hardly going to help. In the budget, Jaitley increased the farm credit corpus from Rs 8 lakh crore to Rs 8.5 lakh crore and announced the setting up of a Unified National Agriculture Market to provide farmers better price for their produce. The new market, he said, will replace the state-run Agriculture Marketing Price Committees (APMCs). Currently, 2,477 principal APMCs operate across the country; these regulate 4,843 sub-market yards. But they benefit just 8 per cent of country’s farmers, according to the Shanta Kumar committee report released in January this year. “The prescription is misplaced and routine,” says Devinder Sharma, agriculture and food policy analyst. His disappointment arises from the fact that around 94 per cent of the present farm credit corpus goes directly to agro-based industries, not to farmers. Experts say instead of just mindlessly increasing the farm credit corpus, the Centre should define farm credit. 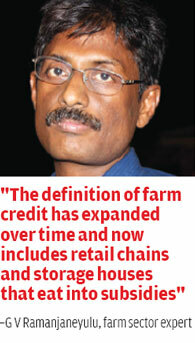 “The problem is that the definition of farm credit has expanded over time and now includes retail chains and storage houses that eat into the subsidy,” says G V Ramanjaneyulu of Hyderabad-based non-profit, Centre for Sustainable Agriculture. Experts are also unsure of the Centre’s decision to restructure and delink Centrally-sponsored schemes. The 14th Finance Commission recommendation, accepted by the Centre, say states should be given autonomy over farmer schemes because agriculture is a state subject. “Now each state will have to decide how much budget it needs under the Rashtriya Krishi Vikas Yojana (RKVY),” says Nilachala Acharya, senior research fellow at Delhi-based advocacy group, Centre for Budget and Governance Accountability. “But it is too early to put the responsibility on the states because they do not have the required infrastructure to implement the scheme. 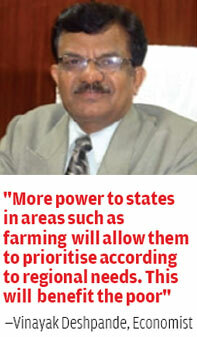 This will finally impact farmers,” says Acharya. 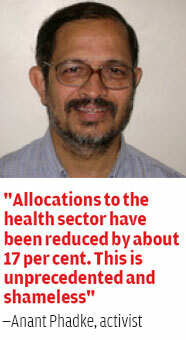 FOR THE first time in the past seven years, India’s health budget has been slashed. The allocation this time— Rs 33,152 crore—is Rs 6,000 crore less than last year’s grant of Rs 39,238 crore. Though health budget has seen an increase of 81 per cent in the past six years, from Rs 21,680 crore in 2009-10 to Rs 39,238 crore in 2014-15, the good run has ended. While presenting budget 2015, the finance minister continued his party’s rhetoric on health, saying that good health is necessary for a person to ensure a good quality of life, productivity and for being able to support his or her family. However, his idea of providing healthcare facilities to public began and ended with providing health insurance. “A large proportion of India’s population is without insurance of any kind—health, accidental or life,” he said in the budget speech. 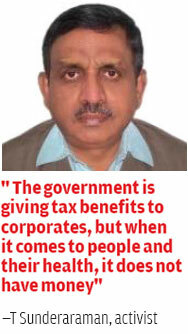 He announced increase in tax exemption on health insurance premium from Rs 15,000 to Rs 25,000. For senior citizens, the limit will be increased from Rs 20,000 to Rs 30,000. “For very senior citizens of the age 80 years or more, who are not covered by health insurance, deduction of Rs 30,000 towards expenditure incurred on their treatment will be allowed,” Jaitley said in his speech. The minister also announced his intention to amend laws and help government employees choose between the government-owned Employees States Insurance Corporation and private health insurance companies (recognised by the Insurance Regulatory Development Authority). But as people opt for private health insurance and move to private hospitals, the state of public health facilities is likely to deteriorate. Jaitley’s announcements are likely to increase patients in private health institutions and put public health in the hands of the private sector. Concrete steps to improve public healthcare infrastructure do not figure in his scheme of things. Public health experts would term this as abdication of duty. The finance minister did talk about providing medical services to each village and city, but the budget allocated is simply not sufficient. His special scheme to provide physical aids and assistive living devices to senior citizens living below the poverty line (BPL) also lacked focus because he did not mention how many senior citizens come under the BPL category. It is, therefore, not clear how many people will benefit. BUDGET 2015 says the government targets to add 175 GW of renewable energy by 2022. Of this, 100,000 MW would be produced from solar energy, 60,000 MW from wind, 10,000 MW from biomass and 5,000 MW from small hydropower plants. Though these targets are higher than previous ones, experts say achieving them would require substantial investments in generation and transmission. But the allocation to the Ministry of New and Renewable Energy has been reduced from Rs 3,941 crore last year to Rs 3,660 crore—a reduction of 7 per cent. There is no change in grants for the Power Grid Corporation of India Ltd or for green energy initiatives, such as Green Energy Corridors, says Jyotsna Goel, senior budget analyst. This does not raise much hope. A promise the budget does make is to provide round-the-clock power to the entire country by 2020. This includes providing power to 20,000 villages which have yet not received electricity. Solar power, generated off the grid, would be taken into account for gauging success in reaching this target. A good initiative announced in the budget is for training 50,000 people in solar energy technology. Named Surya Mitra, the programme aims to increase solar power generation by making people aware of the advantages of solar power use. An outlay of Rs 10 crore has been given to the scheme. Reduction of customs duty on solar photovoltaic cells is also likely to encourage the use of solar energy. Overall, the planning this time is better than what it was in previous years, says Jasmeet Khurana of non-profit Bridge to India, which works on renewable energy. The inverted duty structure introduced in the budget (a scenario wherein the customs duty on raw material/components is higher than the duty on the finished product) is expected to encourage production of solar power equipment in India, he says. 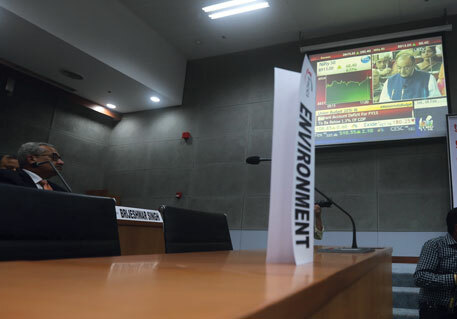 THE FINANCE minister paid lip service to climate change and mitigation this budget. He mechanically increased the cost of diesel and petrol by Rs 3 per litre and hiked clean energy cess on coal and lignite from Rs 100 per tonne to Rs 200 per tonne in a bid to rationalise the country’s carbon footprint. However, experts say the rise in the cost will do more harm than good. 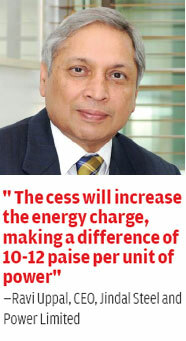 E A S Sarma, former power secretary, says the demand for petrol, diesel and coal is not elastic and therefore, an increase in such taxes will not bring down carbon footprint. Additionally, power manufacturers say the additional surcharge will increase the production cost of electricity and, in turn, impact people. Experts say that instead of just increasing taxes, the government should devise a mechanism to successfully channelise the already collected money for funding research and implementation of green technology. Their demand seems valid when one considers that just 1 per cent of funds have been used by National Clean Energy Fund, which was created in 2010-11 using carbon tax and clean energy cess to fund clean technology. Till June 2014, the fund had a collection of Rs 40,000 crore, out of which just Rs 400 crore got spent. 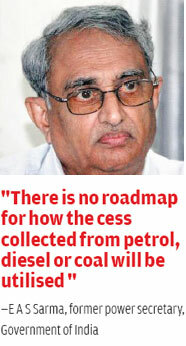 The story is not much different in the case of the annual cess collected through petrol and diesel sales as Oil Industry Development Tax for conservation and research and development of petroleum resources remained underutilised till 2013. According to an oil ministry note, from December 2013, India’s oil industry had paid Rs 118,500 crorecess of which the finance ministry had paid only Rs 908 crore to the Oil Industry Development Board (see ‘Misplaced focus’).